My favorite crafts that my kids give me are ones they make on their own. I cherish them. They are snapshots of who they are the moment they give it to me. This Mother’s Day Handprint Craft is an idea that my kids and I came up with to share. We thought it would make the perfect Mother’s Day gift from kids. 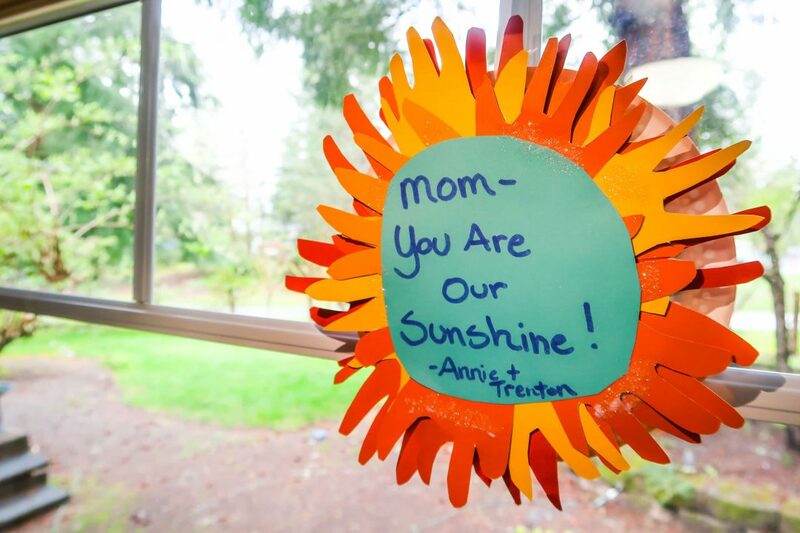 A perfect kids handprint sunshine Mother’s Day card. Handprint crafts for Mother’s Day are cherished because they commemorate your child’s growth. It is fun to look back and see just how much your child has grown. Who doesn’t love an adorable handprint from their child? Trace around each child’s hand on construction paper. Switch colors of paper to use as layers. Cut out each handprint. If your child is old enough, they can help with this using safety scissors and your supervision. You will use 4 handprints per layer. Layer by Layer, glue each handprint onto the back of the paper plate. Build the finger layers to look like rays of sunshine and fill in gaps. Cut a circle out of a different colored construction paper to glue in the center, on top of the handprints, with a message to mom from the kids. If you would like, embellish with glitter. Let dry. Punch a hole at the top of the paper plate to weave string or ribbon through. Have Mom hang it in her favorite spot. Handmade Mother’s Day gifts from kids are the best. I cherish mine from my kids. My daughter and son both love crafting, so this gives them just as much joy. I hope this Mother’s Day gift is just as cherished. Enjoy your Mother’s Day!